Saint Lucia is a sovereign island country in the eastern Caribbean. Part of the Lesser Antilles, it is located between St. Vincent to the south and Martinique to the north, with Barbados approximately 174 kilometres to the southeast. The island measures just 43 kilometres long by approximately 22 kilometres wide and has a coastline of 158 kilometres. With its sandy palm-fringed beaches, crystal clear waters, beautiful bays and lush rainforests, it is a popular destination for tourists and cruise ships. The island is the only country in the world named after a historical woman, specifically Saint Lucy of Syracuse, who was executed in 304 and venerated as a saint in Roman Catholic, Anglican, Lutheran, and Orthodox churches. Legend has it that some French sailors were shipwrecked there on 13 December, which is the feast day of St. Lucy, and named the island in her honour. The French were the island’s first European settlers, signing a treaty with the Carib Indians in 1660. Over the next 150 years, the rule of the island switched at least 13 times between France and Britain – giving rise to the nickname ‘the Helen of the West Indies’ – before the British gained definitive control in 1814. After becoming one of the West Indies Associated States in 1967, Saint Lucia gained its independence from the UK on 22 February 1979 and became a member of the Commonwealth of Nations. English is the official language of Saint Lucia, although Saint Lucian Creole French is also used. St. Lucia is more mountainous than most Caribbean islands and even has a drive-in volcano. On the southwestern side of the island, two volcanic peaks rise up out of the clear blue waters. These peaks are the Pitons, the Gros Piton being 771 m high and Petit Piton 743 m high. This area was designated a UNESCO World Heritage site in 2004 and is located near the town of Soufriere, which used to be the French capital of Saint Lucia. Many tourists visit Soufriere for the tranquillity of the Saint Lucia Botanical Gardens and the medicinal properties of the Sulphur Springs. The modern day capital is at Castries, a flourishing port city in the district of Castries, where nearly a third of the island’s population live. Castries took over as the capital city in 1967 and retained that honour when Saint Lucia gained its independence. The local climate is tropical, moderated by northeast trade winds, with daytime temperatures averaging around 30°C, falling only to around 24°C at night. As the island is located near to the equator, the temperature does not vary greatly throughout the year. Saint Lucia typically has two seasons during a year, a dry season from December until the end of May, and a wet season from June through November. Saint Lucia is a two party parliamentary democracy, and a Commonwealth nation. Queen Elizabeth II is the Head of State, and her presence is represented by a Governor-General. The Prime Minister is usually the head of the party that commands a majority in the House of Assembly. There are 17 seats in the House of Assembly, and 11 seats in the second chamber of Parliament, the Senate. The seat of government is located in Castries, which also houses the head offices of many foreign and local businesses, a number of international embassies and consulates, and the secretariat of the Organisation of Eastern Caribbean States. The city is located in Castries Quarter in the northwest of the island, one of eleven ‘quarters’ (administrative districts) that the country is divided into. The country is a mixed jurisdiction in that its legal system is based on both civil law and English common law. 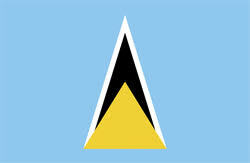 As well as being a member of the Commonwealth and the United Nations, which it became a member of in December 1979, Saint Lucia is a member of CARICOM (the Caribbean community) and the Organisation of Eastern Caribbean States. It maintains friendly relations with all of the active major powers in the Caribbean including the US, UK, France and Canada. Saint Lucia is categorised by the UN as a Small Island Developing State economy. Its GDP grew by 3% in real terms during 2017 and is expected to have grown by a similar amount in 2018. Its 2017 nominal GDP figure of $1.712 billion ranked 167th on the World Bank listings, but in terms of nominal GDP per capita rankings, Saint Lucia’s figure of $9,574 placed as high as 68th. The services sector accounted for 82.8% of GDP, followed by industry at 14.2% and agriculture 2.9%. The island nation has been able to attract foreign business and investment, especially in its offshore banking and tourism industries, attracted by a well-developed legal and commercial infrastructure, an educated workforce, improved roads, an upgraded communications system, port facilities, and a business-friendly entrepreneurial climate. The manufacturing sector is the most diverse in the Eastern Caribbean area. Crops such as bananas, cocoa, coconuts, avocados and mangos are grown for export. Tourism is vital to Saint Lucia’s economy, accounting for 65% of GDP, and is the main source of jobs, income and foreign exchange earnings. The popular tourist season tends to be January to April during the dry season. The island was attracting over 900,000 visitors annually, most of which were stopping off as part of a cruise. However, statistics released by the Caribbean Tourism Organisation (CTO) showed that Saint Lucia recorded an all-time record with 1,105,541 inbound tourist arrivals in 2017. This represented an impressive 11% increase over the previous year and was the highest percentage growth amongst all CTO members. A different kind of tourist attraction is the Saint Lucia Jazz Festival. First held in 1992, this annual event has grown in stature and encompasses live music performances, street parties, educational activities and fashion shows at various venues across the island. This year’s festival celebrating local, Caribbean and international jazz music commences on Monday 6th May and finishes in a major concert on Monday 13th May at the Pigeon Island National Landmark. The Saint Lucia Citizenship by Investment Programme was founded in 2015 and came into force from 1 January 2016, making it the newest of the Caribbean citizenship programmes. Saint Lucia is a stable nation and has a quality of life that very few places in the world can rival. Having a Saint Lucian passport allows for visa-free travel to more than 120 countries, including most of Europe, the UK, and Hong Kong. Saint Lucia recognises dual citizenship, which can provide advantages for business expansion and tax belief. There is no tax on wealth, gifts, foreign income or capital gains. There is no requirement to visit Saint Lucia during the application process, no interview requirement and there are no residency requirements. This is a fund established to receive investments of cash from the citizenship program that will be used in the funding of government sponsored projects. The Finance Minister must seek approval from Parliament for the allocation of funds for his chosen purposes. The Cabinet of Ministers evaluates proposed real estate projects for the possibility of citizenship. Approved real estate projects may be luxury branded hotels and resorts or high-end boutique properties. The minimum investment is US$300,000 per application plus additional government fees of US$50,000 for the main applicant and US$35,000 for spouse, plus additional fees for dependants. The real estate must be held for at least five years following the grant of citizenship. Applicants may choose to make investments in pre-approved enterprise projects such as marinas, research institutions or infrastructure projects (e.g. ports, bridges, roads and highways). Joint investments are allowed, with each applicant investing at least US$1 million and the entire project must be valued at no less than US$6 million and create at least six permanent jobs. A sole applicant must make a minimum investment of US$3.5 million and create at least three jobs. The fourth option is through the purchase of non-interest-bearing Government bonds. These bonds must be registered and remain in the name of the applicant for a minimum of five years from the date of first issue and not attract a rate of interest. • Each extra dependant: US$25,000.